Part One: Put your self in their shoes. My fears were allayed by a family that cared. All found in the arms of a village called Winkleigh. With the Blitz raining on the nations capital like an insatiable nightmare, something had to be done for the children. Surely they weren't to blame? So from the corridors of power in Whitehall came the decision to evacuate thousands of school age children from London to the relative safety of the British countryside. In no small measure, an exodus of uncertain boys and girls, infant to teen, were bundled off to places they'd never heard of, not knowing if they would ever see their families or homes again. For the lucky few, some parents had already the insight and means to ferry their offspring off to family & relations who lived away from the industrial targets of the bombers for the duration. Others got pot luck. Norfolk, Wales, the Yorkshire Dales and the West Country, who knows? For many London born youngsters who had never even seen a real cow, let alone a sheep or a hen house, they were about to get a shock. Many were children who'd been used to sharing meagre rations on empty tables night after night, that's before huddling up in a corrugated makeshift Anderson shelter that had been hastily buried in the back yard. There they would sleep or wait for the bangs. That is if you were lucky enough to have a back yard. For those who didn't, there was the trek down to the end of the road to look forward to and the floor of a white tiled London underground station as a mattress to spend another night on. The trick; Get there before the sirens heralded in another night of terror and fire and destruction. But for them, there was to be a sweet surprise ahead. John Andrews was eleven, his twin brothers Peter and Robin just seven when they left their home in South London and arrived in Winkleigh. It was their second taste of evacuation so they were old timers. The first was the Blitz, now the buzz bombs. Fortunately, someone had the sense to keep them all together but John still didn't really know what all the fuss was about? He was a boy after all and had a great time in London with his brothers watching the flying bombs as their engines cut out and they plummeted into the city with a thud. Explosions and fires at a distance curried no danger for a little lad and his pals and his brothers were just too young to really understand what was going on? Despite all of that, one day they were bundled into a train with a gas mask over their shoulders into which they packed their sandwiches, a name badge stuck on the lapel of their school coats and headed out for a great new adventure from a station that he can't remember. The evacuation of the children of London was administered by the WVS and the journey must have seemed interminable. It's bad enough even these days and of course made all the worse for the children because by half an hour into the journey, the packed lunches were demolished! Sometime after dark, the train which had been stopping and starting with alarming regularity, arrived in Exeter. The children were divided up into groups and hustled on to busses. The next thing they knew, the bemused children were in Winkleigh. The newly built village hall is the first landmark John remembers. "Winkleigh in 1944 was a different planet. " "My first memories of Winkleigh were of arriving in the dark at the Village Hall (opposite the school) and standing with the other evacuees on the stage in front of a sea of faces - Villagers who had come to see who they might have. Winkleigh Village School today. Little has changed. Mrs. Jack Ford from Sedgets in Lower Town took the three of us, although she had come with the intention of taking a girl 'to help in the house'! We three boys had a great time and witnessed "civilisation" come to Winkleigh. But there were complaints that the light was bad for the eyes, but within a few months hundreds of oil lamps were thrown away! Then came Mains Water. The complaints then were that the water doesn't taste right and many continued to use the wells until the Council blocked them. Finally came Mains Drains and flushing toilets, but in some places it was not welcome, as it was felt that the "privvy" was a private and special place - usually in a sunny spot in the garden with the door opening inwards. The thought of having your toilet physically connected to the one next door was quite revolting! The Aerodrome was of course a centre of fascination for young boys. 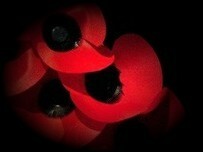 I remember standing on the steps of the Village Hall and looking down on a Liberator flying very low down the valley. As boys we would creep inside the airfield fence through the grounds of the derelict Seckington House right at the south end of the main North / South runway and note the types and numbers of the aircraft. I seem to remember that the last flying units were the Norwegians training on Havards and Cornels. During the war the Americans and Canadians used to come to Sedgets to buys eggs and chickens." My brothers and I did not return to London and our mother eventually joined us renting the other half of Sedgets. She worked at the aerodrome "labour" office administering the gangs of men working on the farms - the Italians then the German prisoners of war - then came the DPs (Displaced Persons) - Latvians, Ukrainians, Lithuanians and Estonians all of whom worked on the local farms and excited the local girls. 99% of them moved on but one or two stayed behind and changed their name from Kasprowitcz to Smith! My Winkleigh memories effectively stopped in 1951 when I was called-up into the army, but my brother's memories continued to at least 1956 when Robin was married in Winkleigh Church." The three Andrews brothers are now all over 70. John is now 75, a semi-retired engineer living in rural Lincolnshire, his younger brother Peter 71 is a retired civil servant living near Swindon and twin brother Robin is a retired architect living just outside Chicago - He has dual US and UK nationality. Ironically, from those balmy days in Winkleigh as an child evacuee collecting aircraft numbers on the Winkleigh airfield, John was to have a great time in the army as a young man and go on to make a major change in his career, joining the Royal Air Force in his late 30's after 20 years as a production engineer and straight in with the rank of Squadron Leader. Eventually working for the Ministry of Defence, John accelerated to the rank of Wing Commander & did not retire until his sixty fifth year. Must have been the Winkleigh air John! *This web page is still being added to and more accounts and stories of Winkleigh in the war years are yet to be told. If you were a war time evacuee to Winkleigh in Devon between 1939 and 1945, we'd love to hear from you. Many thanks to Wing Commander Andrews for permission to publish his memoirs of Winkleigh.